The advent of computer video games has produced a generation of people with a keen orientation in three dimensional space and superior eye-hand coordination. Orientation in three dimensional space is fundamental to R/C flying. The transition from the monitor to the real thing is fairly easy. Years ago, beginners learned eye-hand coordination and 3-D orientation with fragile airplanes made of unforgiving balsa wood and tissue. They were slow flying high wing rudder-only floaters. One rough landing could mean hours of repair. Zagis are made with EPP (expanded polypropylene) foam. This material is resilient and forgiving. Trial and error is not a problem. Another advantage the Zagi wings have over a conventional design is that flying wings have fewer parts. So the best Zagi to learn on is the gliders. Next best is the Zagi electrics because of their pusher configuration. The motor is not the first thing to hit the ground. Zagi, LLC makes three categories of flying wings; electric power, slope soaring, and thermal soaring. All three types of Zagis are available as a complete combo to provide the beginner everything necessary to assemble and fly a Zagi. Electric power is a motorized system that can fly almost anywhere. The rear mounted pusher motor is powered by a airborne rechargeable battery or flight pack. A separate charger is required to charge the flight pack. The flight pack provides ten to twenty minutes of flying time between charges so a few packs are desirable. Zagis use of a rear pusher motor is to prevent impact motor damage. The new Zagi electric is a good beginner airplane because it bounces. 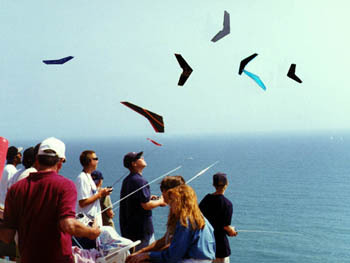 Slope soaring is flying on the updraft of air resulting from wind passing over a slope without a motor. Simply throw the Zagi-5C off the hill, into the wind. You can fly on the updraft till you decide to land. Thermal soaring is simply imitating soaring birds by searching for rising currents of warm air (thermals). This type of soaring requires the most time to learn. Reading invisible air currents takes practice. Thermal soaring requires a winch or a hi-start to launch. A hi-start is a length of light surgical tubing attached to a length of monofilament fishing line. Attach one end to a tow hook on the airplane and the other end to the ground. Stretch the line out and catapult the airplane skyward. This method can give you a launch of a hundred feet or more. The winch is a motorized pulley system to do the same thing and gives you a lot more altitude. EPP foam has made learning to fly a lot easier. Airplanes made from this rugged material can be crashed repeatedly without damage. The Zagis earned their reputation in combat by experienced pilots trying to whack each other out of the sky. An average combat event involves about twenty midair collisions and as many collisions with terra firma. The most durable airplane for beginners should be made of EPP foam and should have the fewest parts. That’s the Zagi 5-C. It’s an all EPP wing with five carbon fiber spars. Since not all flyers have the luxury of slope soaring geography, the electric Zagis were developed. The Electric Zagis are more expensive but offer the most versatility. They’re sturdy and they can be flown anywhere. Whatever you decide to fly you’ll need a radio system consisting of a transmitter, receiver, some servos and a battery. The price range of the radio systems start at $110.00 and can go to over $700.00. The airplanes on this web site can be flown with the lower priced radio. The Airtronics SD-5G 2.4 G 5-channel radio is a perfect entry level radio system.